Whakatāne kiwi might be in your backyard or just off the trail – training your dog could save a kiwi’s life! Kiwi aren’t like other birds; dogs find their strong musky smell interesting. Without wing muscles to protect it, the kiwi’s chest structure is easily crushed in a dog’s mouth. It doesn’t take a huge hunting dog to kill a kiwi – even a playful or curious bite can damage kiwi internal organs and result in death. Statistically, dogs are the main threat to adult kiwi. With many of our breeding birds within 1km of Ōhope and Whakatāne, one loose dog could decimate the entire Whakatāne kiwi population. For example, in Northland between 1990 and 1995, dogs were responsible for 70% of all kiwi deaths in the region. Of the 135 birds killed over those 5 years, 29 were killed by family pets – some dogs were with their owners but off lead, and others were roaming at night. It only takes ten minutes to put your dog through kiwi aversion training, which is an effective way of deterring your dog from being attracted to kiwi. 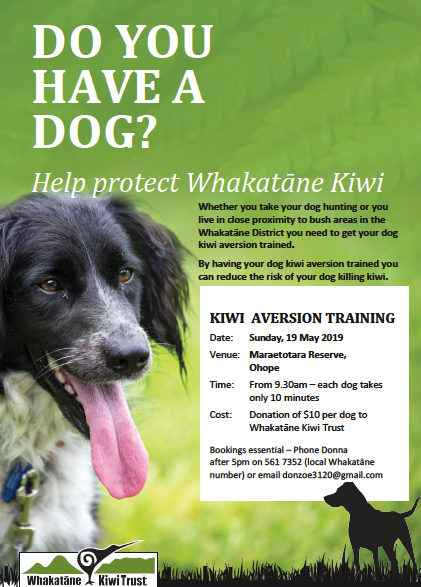 The Whakatāne Kiwi Trust organises regular kiwi aversion training sessions, the next one is on Sunday the 28th of April 2019, email us to book your dog in now. Guus Knoppers is the trainer we use for our Kiwi Aversion Training sessions. He is the Director of the K9 Detector Dog Centre and is an exceptionally knowledgeable and experienced dog trainer and handler. Dogs he has trained have worked around the world for conservation, narcotics, explosives and bio-security. His company has some of the most extensive dog teams in NZ. Guus has been certified to conduct kiwi aversion training in line with the national protocols for this method.